Peep the new intro! Peep the new outro! That must mean it’s season two of the only podcast investigating the mysterious, strange, and paranormal in the Pennyroyal and all around the Bluegrass, Midnight In Kentucky! 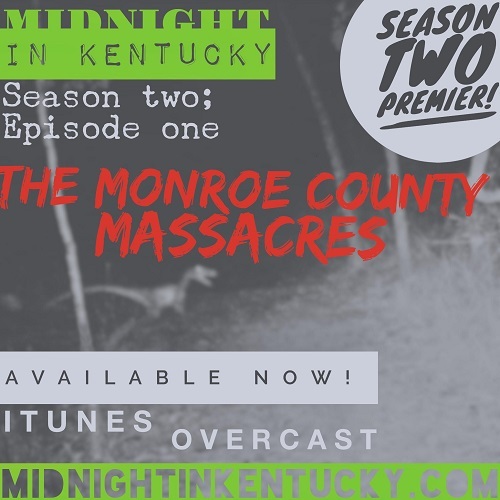 In this, the first episode of season two, we take a look at the rash of strange animal slayings in Monroe County, Kentucky, in September of this year and speculate as to the cause of the horrific massacre. Dogmen, Sasquatch, UFOs, tiny dinosaurs, and mountain lions all make a cameo in this season premier and we briefly discuss the mystery booms heard and felt around a thirty mile radius in central Kentucky recently. Beware the Land Between the Lakes Beast and listen to Midnight in Kentucky: Season two; Episode one: The Monroe County Massacres!